In Twilight Zone reruns, I search for my father in the man on the screen, but I can't always find him there. Instead, he appears in unexpected ways. Memory summoned by a certain light, a color, a smell--and I see him again on the porch of our old red lakeside cottage, where I danced on the steps as a child. 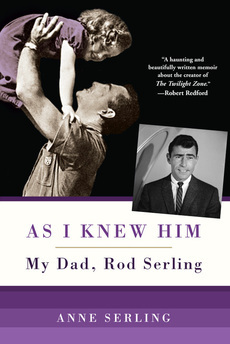 To Anne Serling, the imposing figure the public saw hosting The Twilight Zone each week, intoning cautionary observations about fate, chance, and humanity was not the father she knew. Her fun-loving dad would play on the floor with the dogs, had nicknames for everyone in the family, and was apt to put a lampshade on his head and break out in song. He was her best friend, her playmate and her confidante. After his unexpected death at 50, Anne, just 20, was left stunned. Gradually she found solace for her grief by talking to his friends, poring over old correspondence, and recording her childhood memories. Now she shares personal photos, eloquent, revealing letters, and beautifully rendered scenes of his childhood, war years, and their family's time together. Idyllic summers in upstate New York, the years in Los Angeles, and the myriad ways he filled their time with laughter, strength and endearing silliness--all are captured here with deep affection and candor.